We still do not know what happens after death. However, we know what happens to those who stay here! Our EXTOR model, developed by the PARTTEAM group, interprets through its functionalities and technology, the main role in a cemetery located in the Italian city of Torino. The operation is simple, just enter the data of the loved one (name, date of birth and death) and the kiosk shows the fastest route to reach the place where the deceased person is.
" 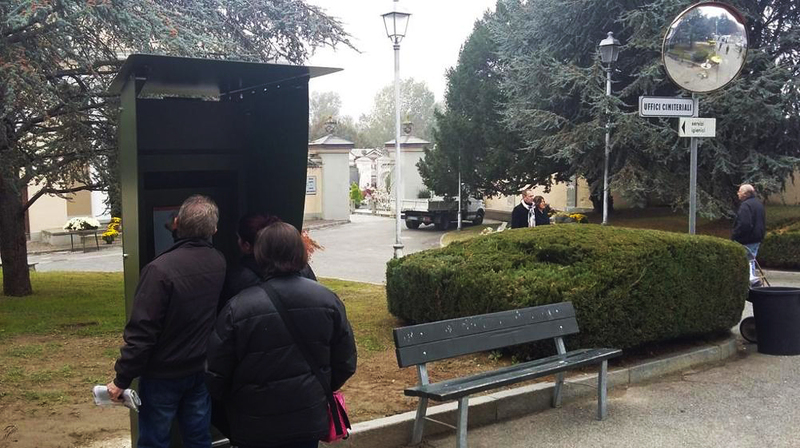 ... Al cimitero di Moncalieri arriva il totem per trovare dov’è la tomba dei propri cari ... "
This project made us very proud, because through our interactive media kiosk EXTOR , we can help people find faster, your loved ones In the cemetery. PARTTEAM aims to create technological tools that facilitate and accelerate the tasks of any individual, adopting and valuing practices of social responsibility to achieve the objectives. We are able to produce equipment and custom solutions , with the required functionality without sacrificing creativity, whose end result will surely guarantee the success of the project in its first approach.